Well, today was my first ever day captioning live on the air. Never have I been so excited, yet so nervous in my life! Things went pretty well, though, and I only had a slight audio problem on my second show. It wouldn’t connect! It didn’t kick in until about 30 seconds in to the show, and it took a few minutes for the sheer panic to subside and begin writing, but I recovered. On to tomorrow! There’s something to be said about being able to work in your pajamas. It was great! Heck, if I’ve got to start working at 6:30 a.m., I might as well be comfortable, right? But enough about my day, because I want to share with you a new product line Zazzle has introduced within the past few weeks…fabric! I know there are some crafty steno lovers out there, quilters, DIY’ers, and the like, so I’ve began adding designs to fabric. I ordered a couple fat quarters for myself just so I could see how well they are made. I am very impressed with how Zazzle has managed to migrate to such a tricky product like fabric. I think they both printed out very well. Stay tuned, and I’ll show you what I’ve made out of my court reporting fabric. Fabric can be purchased in either 100% cotton, polyester, a combination of both, or linen in as little an amount as a swatch up to however many yards your project requires. They’re sold in upholstery and drapery weight as well. Wouldn’t a captioning or court reporting covered chair be neat? One word of advice, though: don’t wait until the last minute to order fabric for your projects. Each design is printed as they’re ordered, so allow production time, as well as shipping time when you place your order. I ordered my fabric on February 11th, and I received it on the 23rd. 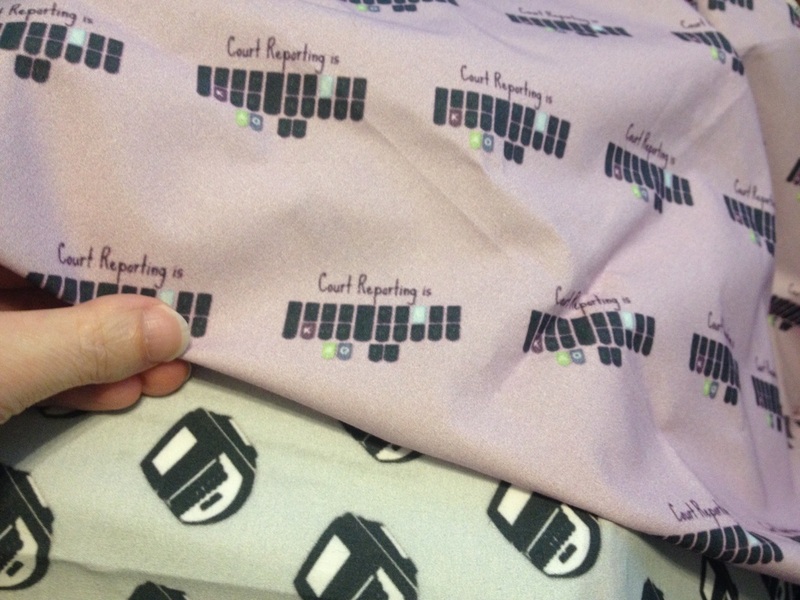 Already thinking of things you could make with your very own steno fabric? A steno quilt maybe? Or how about a custom court reporter computer bag? The possibilities are endless! Court Reporter to Captioning Training: Time for Boot Camp!